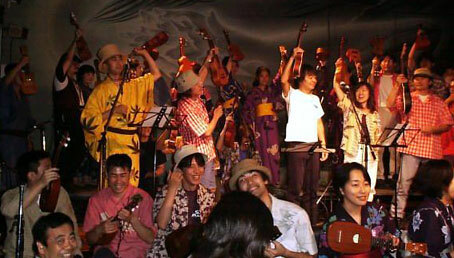 the new movements of amateur ukulele players had been exploded in the other parts of Japan also. On Mar.21, UA went for Osaka to meet Kanlele (Kansai Ukulele Circle), which is the most active circle in the western area (Osaka, Kyoto, Kobe). On the street they had guerrilla performances together with 40 players. On Apr.29 in Shibuya, the free stages at the citizen's festival "Shibuya Paradise". On Jun.6 at the party of NUA 40th Anniversary, UA played at the front of Mr. Jim Beloff to be admired. 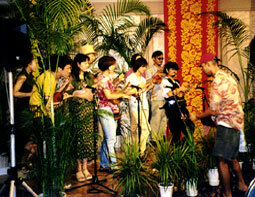 Within the wide tendency of ukulele in boom, UA produced the first big concert since from their re-start. 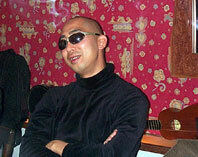 On Jun.27 at CAY in Aoyama, "Welcome Back to Ukulele Cafe NITE 1999" was held. 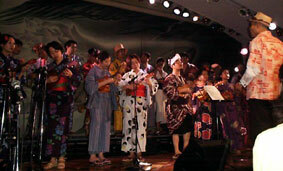 The performers were amateurs/professionals who might strongly appeal to the new generation of uku-lovers. 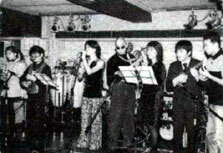 On the stage with Purin (girls duo with uku and singing the original songs), Ukulele Club (uku & guitar jazzy duo feat. 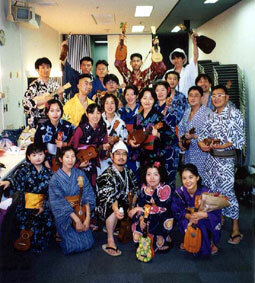 Mikihiko Matsumiya), Ukulele Cafe Quartet (reunion), ukuleleman iwao (famous star player of the young) Yuki ALANI Yamauchi (pioneer of Hawaiian music in Japan), 25 members of UA appeared in the costume of Japanese traditional summer-kimono. They played The Ventures' "Pipeline", French chanson "Paris Canaille", Japanese techno pioneer YMO's hit tune "Kimi Ni Mune Kyun", theme from the TV shows "Shouten" and "Lupin The Third", and other UA's classics "Waikapu", "Raindrops Keep Fallin' On My Head", "Tequila", "Corazon De Melon" and "Everybody Needs Somebody To Love". The concert successfully drew 220 people in the audience. 5 hours of the show was closed with The Greatful Deads' "Ripple" by the all stars. On Aug.13/14 "Hawaiian Festa '99" at Shinagawa Prince Hotel, and Aug.29 "Beat Festival '99" at Asakusa View Hotel, UA appeared on some Hawaiian events even though they would not play any Hawaiian songs. On Dec.4 UA produced another "unheard-of" concert at Azabu-Juban Public Bath Theatre. The entrance ticket was including free pass to the spa room. The performers and the audiences together sat on tatami-mat to enjoy the show with some beers and the dishes. Each members of UA appeared with hanging towels, wearing pajamas, bathrobes, night-gowns, suteteko & momohiki underwears as an "After Taking Bath Style" on the stage. They played Caribbean Martinique banjo player KALI's tune "Bel Presi", cabaret classic "Harlem Nocturne", R&R version of Malay trad. "Ikan Kekek", plus some numbers from their "Exotic X'mas" songs. The concert was also starring Petty Booka, with the debut stage of Natsu Machi Komusume (girls duo of uku and singing the originals, later its name becomes UKULALA), the reunion of Mood, and an amazing avant-garde stage of Japanese-French chanson unit "Soiree & Sabu" (vocal & accordion). On Dec.26, non-PA live at the small Jazz bar Blue Note in Yokosuka by small members. On New Year's Eve count down event "Michel Polnareff Tribute", Soiree invited UA on the stage to play The Greatest French-Rock Star's number "Lettre A Franse" together.